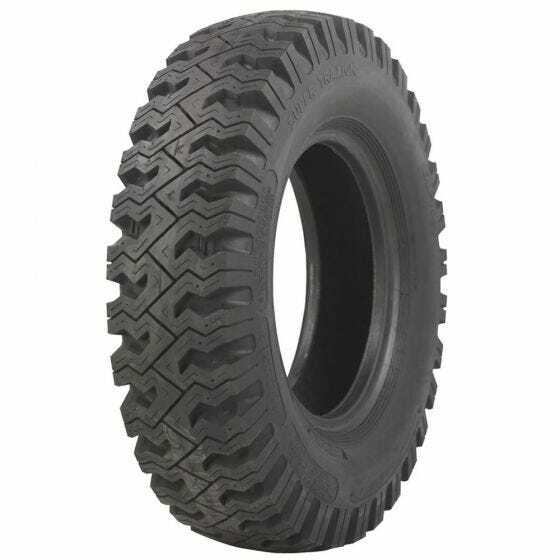 These long lasting and durable tires offer exceptional traction for pickups, vans, campers on both highways and for off-road uses. Super Traxion tires have a minimum stone retention design. Clean out is a snap as mud and stones are cast off as the tire rotates. Other features include great traction with husky lugs that are pinned for studs. STA Super Traxion 7.50-16 tires are cool running with deep vented shoulders and wide profile for flotation and traction. Item #68758 requires an inner tube, item #71031 is tubeless. What is the actual diameter of these tires, and width? I have 16x8 smoothie steel wheels and looking for a good classic looking tire for my Jeep. Would these work or are they too narrow for a 8 inch wide rim? This tire features a 32" overall diameter and an 8.70" section width. The recommended rim width is 5" - 6". It also requires a tube. This tire has an overall diameter of 32".